Responds to touch: meet your new BFF! Zoomer playful pup is an interactive dog that responds to your touch! Give your pet, snuggles, cuddles and belly rubs and he'll “woof” in delight!responds to voice: using sophisticated voice recognition technology, playful pup can learn his name! Give your new best friend a unique name and this pup will come when you call!learns 25+ tricks: using playful pup will learn and perform over 25 tricks! 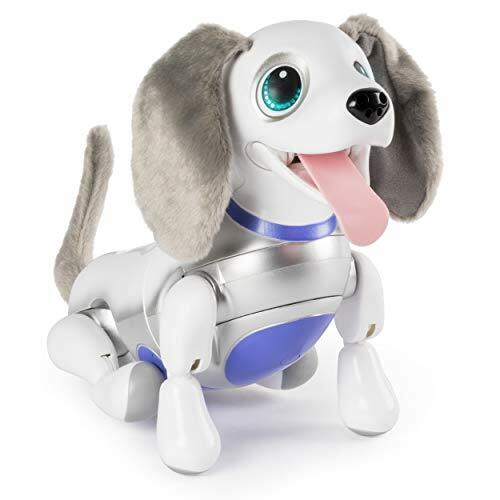 Use voice command to train your puppy to lie down, shake a paw, beg, play Dead and more!zoomer playful pup is an interactive toy for kids aged 5+. USB charging cable included. Bring home your new best friend!